222 pages | 19 B/W Illus. ‘Stop and search’ is a form of police-citizen interaction that is confrontational, often stressful for those involved, and potentially damaging to the relationship between police and public. The extent to which police officers use their power to stop and perhaps search members of the public is intimately linked not only to the present-day context of policing but also to longer term patterns in the aims of policing, the ends used to achieve them, and ultimately to the ideology of policing in England and Wales. Stop and Search and Police Legitimacy draws upon both police-administrative and survey-based data to examine what has for many years been one of the most highly charged and contested aspects of police practice. Taking a decidedly quantitative, empirical, approach, this book examines the patterning of police stops over social and geographic space, the problem of ethnic disproportionality, and the evidence concerning how people experience and react to being stopped by police – particularly in relation to issues of fairness, legitimacy, cooperation and compliance. A further important concern is the extent to which this form of police practice shapes and re-shapes the identities of those affected by it. This ground-breaking study is a comprehensive resource for students and scholars in the fields of criminology, sociology, social policy, ethnic and racial studies and human rights. It will also be of special interest to police leaders and policy-makers. "Ben Bradford’s book expands our understanding of the role of the police and adds significantly to the police powers debate in the UK. As one would expect, the empirical research is comprehensive, stimulating, accessible and makes an original contribution to the stop and search literature." 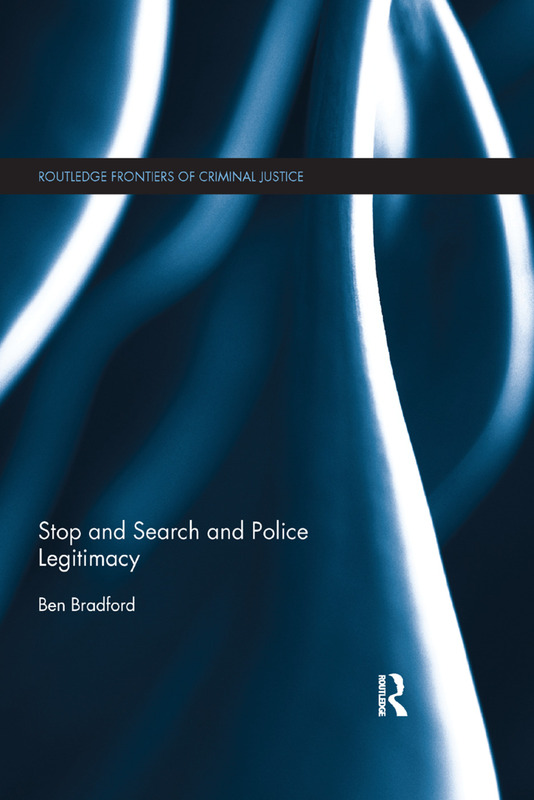 "The use of stop and search is one of the most contentious issues in policing and Bradford provides invaluable analysis in an area where debates are often shallow and simplistic. The rich and detailed evidence is combined with fascinating discussion of the wider role and status of police in contemporary society. This book makes an important contribution to vital debates in criminology and police studies." "Stop and search is amongst the most controversial of policing issues, above all because of the huge disparity in its use against different groups. Ben Bradford has produced a penetrating, provocative state-of-the-art review of the history, use, and potential of the stop and search power. It is a rare combination of sophisticated theoretical and empirical analysis, combining a wealth of detailed data with a comprehensive critique of the fundamental interdependence of stop and search - and indeed policing more generally - with both security and inequality. It is a must-read for anyone with a concern about policing and social justice." Ben Bradford is Departmental Lecturer in Criminology in the Faculty of Law, University of Oxford, UK. He has collaborated with the London Metropolitan Police, the College of Policing, Police Scotland and other agencies on research projects concerned with improving police understanding of public opinions and priorities. Routledge Frontiers of Criminal Justice offers the very best in research on criminal justice systems around the world, offering fresh insights on a range of topics in criminal procedure, including policing, prisons, courts, youth justice, community measures, rehabilitation, victimology and forensics science.